Standing majestically on a limestone outcrop above the village of Castleton in the picturesque Hope Valley, Peveril Castle dominates the surrounding landscape. The castle was founded by William Peverel (c. 1040–circa. 1115) a Norman knight, who was granted extensive lands in Derbyshire and Nottinghamshire by King William I in reward for supporting him during the Norman Conquest of England. William Peverel is listed in the Roll of Battle Abbey. Peveril Castle is one of the first castles built in England after the Norman Conquest. Peverel is thought to have been the illegitimate son of William the Conqueror although this claim remains unsubstantiated, tradition states that Peverel was the son of the Conqueror by a Saxon princess and was born prior to the king's marriage to Matilda of Flanders. The castle layout is roughly triangular, measuring about 90 metres by 65 metres (300 feet by 213 feet). The land slopes steeply away from the castle's perimeter, almost forming a sheer face to the south east. The winding approach from the north marks the most practical approach to the castle. Peveril Castle commands superb views of the Hope Valley below and Treak Cliff, Mam Tor, Black Tor, and Lose Hill. Entrance to the castle was through the gatehouse on its eastern side. The curtain walls which enclose the structure date from a number of time periods and range from stonework dating from the Norman period to modern repairs. Walkways surmounted the walls, a tower was added to the north wall in the 12th century. The southern curtain wall is a modern replacement which runs along the line of the medieval wall. There are the remains of two round or semi-circular towers projecting from the wall. One survives to such an extent that it is possible to discern the use of Roman tiles in the construction which presumably were taken from the ruins of the Roman fort at Navio (Brough). Foundations mark the position of buildings abutting the south wall, which were probably the old hall and a chapel. The keep, (pictured left) which dates to around 1176, was built by King Henry II, England's first Plantagenet monarch, the structure occupies the southern corner of the castle. A projection in the south-east wall of the keep housed a garderobe or medieval lavatory (pictured below right). As was usual with Norman keeps, Peveril's was entered through the first floor and was accessed by a staircase. This entrance level would have been a large public room and the basement used for storage. William Peverel died in 1114 and his son, known as William Peverel the Younger, succeeded to his estates. The younger Peverel supported King Stephen during the civil war of Stephen and the Empress Matilda, a time known as the 'Anarchy' and had the misfortune to be captured at the Battle of Lincoln in 1141. In 1153 he was suspected of attempting to poison Ranulf de Gernon, 4th Earl of Chester and Matilda's son Henry Plantagenet, then Count of Anjou, accused Peverel of "plundering and treachery" and threatened to confiscate his estates and hand them over to the Earl of Chester. Two years later Henry, now King Henry II, carried out his threat. Since the Earl of Chester had by then died Henry appropriated the honour of Peverel to the crown. Once under royal control, Peveril Castle became the administrative centre of Forest of High Peak. 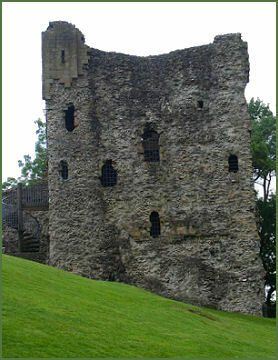 Henry II visited Peveril Castle several times, to hunt and, on one occasion, to meet his cousin King Malcolm of Scotland, who paid homage to Henry at the castle in 1157 for the Earldom of Huntingdon. The castle was also visited by Henry's grandson, King Henry III, in 1235. Henry III regularly spent money on repairs and on the upkeep of the castle. During his reign the two round towers on the south wall were constructed as well as the New Hall. In 1254 the castle was given to his son Edward, later King Edward 'Longshanks' I, Hammer of the Scots, and was then granted to his wife, Eleanor, the daughter of King Ferdinand III of Castile, as part of her dowry. After this, the castle again came into the possession of the crown and was granted to Edward's cousin, Simon de Montfort, Earl of Leicester. De Montfort had secretly married Eleanor, the youngest sister of Henry III in 1238. He led an uprising against his brother-in-law the king in 1264 and following the Battle of Lewes, he gained control of England. Edward, (later Edward I) in support of his father, defeated Simon de Montfort's son Henry at the Battle of Kenilworth and went on to defeat de Montfort himself at the Battle of Evesham in August 1265, where Simon was killed. Henry III was then restored to power. In the fourteenth century the castle passed into the possession of John of Gaunt, Duke of Lancaster, the powerful and influential 3rd son of King Edward III, who was virtual ruler of England during the minority of his nephew, Richard II. On Gaunt's death the castle was inherited by his eldest son, Henry of Bolingbroke, when he later took the throne as King Henry IV, the castle again became part of the crown's estates. By the early fifteenth century the castle had fallen into disuse, a survey in 1561 conducted for the Duchy of Lancaster, recorded that Peveril was already in a state of decay, only the keep remained in use as a courthouse by the early seventeenth century . After the Tudor era, the courts were abandoned and the site gradually deteriorated to became a ruin. The famous nineteenth century author, Sir Walter Scott featured the castle in his novel Peveril of the Peak. Peveril Castle is a Grade I listed building and is now in the care of English Heritage. Displays in the visitor centre tell the story of Peveril as the administrative focus of the Royal Forest of the Peak. There is also a gift shop which stocks a range of items.